Qatar Airways has launched an ‘Australia Day’ promotion with special fares from the UK to both Australia and New Zealand from £579. The lowest fare is offered in conjunction with the airline’s debut services from Cardiff Wales Airport (CWL) to Doha, commencing on 1st May 2018. The airline is also promoting the opportunity to save an addition 10% on the base fare when booking through ‘mobile’ channels, using a tablet or smartphone and the code ‘GOMOBILE‘. Note that the GOMOBILE code is not restricted to Australia and New Zealand however; it should work on other routes, too. Members of the British Airways Executive Club earn Avios at the rate of 25% of flown miles, with the promotional fares booking into ‘W’ class. Sales period: 25 January until 30 January 2018. Travel period: 25 January until 10 December 2018. All travel must be completed by 10 December 2018. Blackout dates (dates when discounts do not apply): 9 June until 10 September 2018. Valid on Qatar Airways operated return flights originating from United Kingdom (London Heathrow, Manchester, Birmingham, Edinburgh and Cardiff) via Doha (DOH) only. Flight for Cardiff commencing 1 May 2018. Fares displayed in the table above are the lowest adult return prices including taxes, fees, and airport charges; all available fare options and applicable rules will be displayed at the time of booking. Seats maybe limited for certain destinations and are subject to availability of the relevant booking class. There maybe times when seats are not available. Please review at the time of booking. Tickets are non-endorsable and non-transferable. Please refer to the fare rules at the time of booking for change, cancellation and no-show conditions and fees. In case of a no-show, a no-show fee is applicable on top of any change or cancellation fees. Change fees are applicable on top of any fare differences. For travel involving multiple booking classes, the most restrictive fare rules apply on the entire itinerary. Please note that for transit flights in Doha of less than 24 hours in duration, baggage cannot be claimed and will be tagged to your final destination. Weekend surcharge: GBP 30 Economy Class / GBP 60 Business Class for Fri/Sat travel. Standard minimum and maximum stays apply. Please refer to the fare rules at the time of booking. For full terms and conditions, please review at the time of booking. 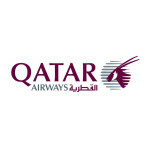 To check availability and book, visit qatarairways.com. 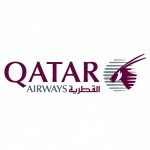 Qatar Airways has published a discount code offering up to 15% off fares in their Economy and Business Class cabins. Bookings must be made at qatarairways.com by 28th February 2016, for various travel dates up to 15th December 2016. Sales period = 22nd February 2016 – 28th February 2016 inclusive. Travel period = 22nd February 2016 – 15th December 2016 inclusive. Travel from Birmingham from 30th March 2016 onwards. Offer valid on Qatar Airways operated flights only. Offer is only applicable to “Economy Promo”,” Economy Saver”,”Business Promo” and “Business Saver” fares. These will be shown when you make your specific flight selections during the booking process. Purchases can only be made through www.qatarairways.com by entering the promotional code SPRING2016 at the time of booking. Qatar Airways will not be responsible for any fare differences if customers fail to enter the given promotional code at the time of booking. Fares displayed will already include the applicable discounts. Discount applies to air fare only. Discounts do not apply to taxes, surcharges and all other standard market surcharges. Valid for return fares and one-ways. Seats are limited and might not be available on all flights. Changes / Cancellations to reservations = Depending on the class booked, a fee may be applicable. Please review at the time of booking. Minimum Stay / Maximum Stay = Depends on the class booked. Please review at the time of booking. There’s a story about waiting for a bus, and nary a charabanc being seen for many a long hour. Then, all of a sudden, four Qatar Airways Airbus A380s come along. Whether that’s relevant or not to the launch of another Qatar sale is up for debate, but hot on the heels of the last one, here’s a flash weekend sale that can get you from the UK to Australia for £615 round trip upright, and flat out for £2775. The travel dates are generous; 1st April to 10th December 2015 for Economy and and even more expansive 30th January to 10th December 2015 for Business Class. The booking deadline is 3rd February 2015, and this could be the last time fares like this are made available. Well, it could be. For full details and to book, visit qatarairways.com. 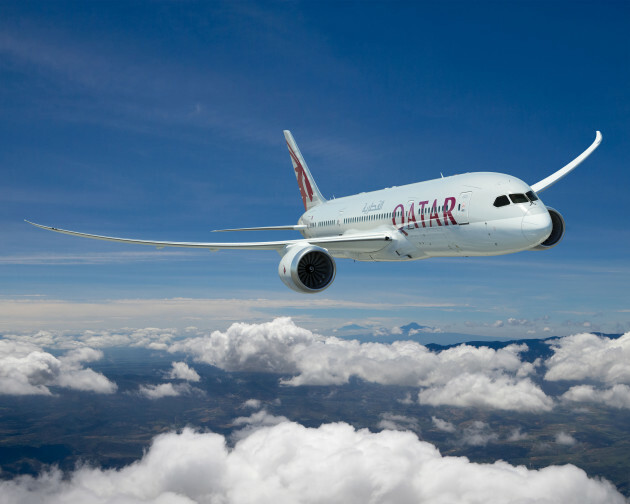 Qatar Airways has made something of a name for itself in recent times with regular sales in its Business Class cabins. For four days only however, the Doha-based carrier is offering some very competitive Economy Class fares to a selection of destinations from an advertised £295 return. In practice, tax calculations may actually bring the fares down to just over £290. Fares must be booked by Friday 23rd January 2015 for travel between 25th January and 31st March 2015. The principal additional stipulation is that outbound travel from London must be on flight QR4 – which, happily, is scheduled for Airbus A380 operation. The Special Offers page at qatarairways.com lists all available fares in full, including those from Qatar’s other UK departure points of Manchester and Edinburgh. The £295 fare is currently available to Dubai, Abu Dhabi and Kuwait; Bahrain is from £300, Muscat from £305 and Sharjah from £400. Passengers may also be able to sample the new Boeing 787 Dreamliner on selected inbound services. Fares book into ‘O’ Class and, for members of the British Airways Executive Club, earn discount economy Tier Points, and Avios at a rate of 25% of flown mileage. In addition, and although not included in this sale, the airline is also offering flights to Bangkok from £425 return and to Hong Kong from £430 return. All flights connect through the newly-opened Doha King Hamad International Airport. For full terms and conditions and to book, visit qatarairways.com. 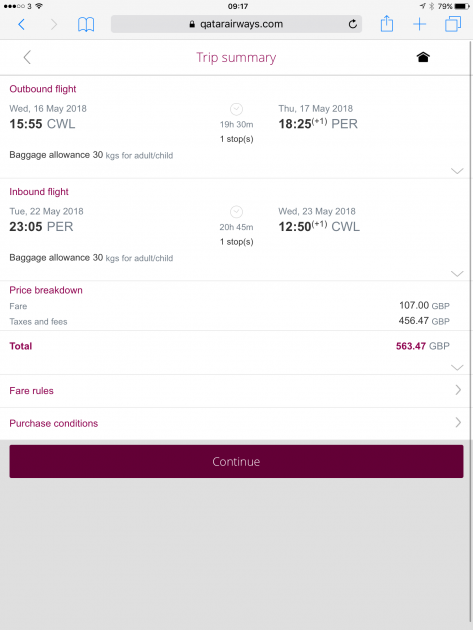 Qatar Airways has made something of a habit of offering ‘two for one’ sales in its longhaul business class cabins of late, but the Doha-based airline’s current promotion is pitched instead as a simple 50% off. The sale runs until 22nd December 2014 for travel up to 31st January 2015, is valid for departure from all of Qatar’s three UK departure points and is available to book now at qatarairways.com. The 50% off sale is based on the airline’s ‘year round’ fares and not current promotional fares in business class, however they should still represent a significant saving over the lowest fares which were available prior to the sale commencing. 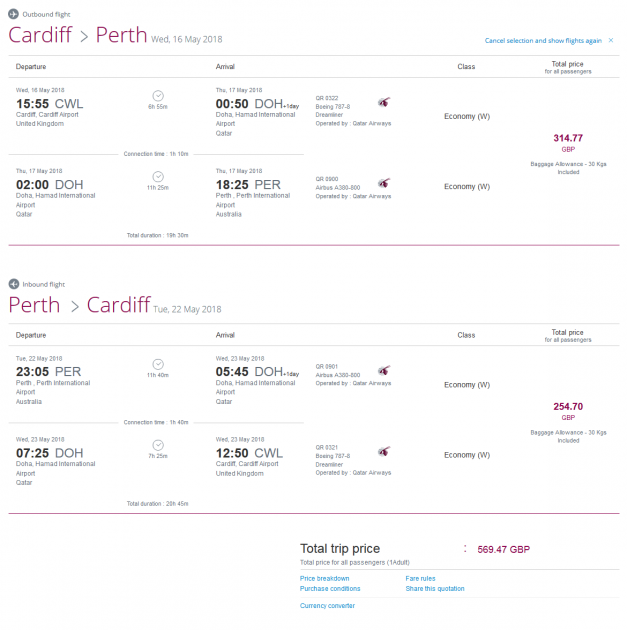 By way of comparison, the last 2for1 sale offered fares to Perth from £2385 per person return, which was for departures from 1st November 2014. This sale therefore offers more flexibility for solo and odd-numbered party size, but is slightly more expensive than the ‘companion’ deal. For full details of this 50% off business class sale and to book, visit qatarairways.com. Qatar Airways has released another ‘two for one’ sale in its longhaul Business Class cabins, including flights to Australia available from £2385 per person return, and to India from £1295 return. The sale runs until Midnight on Friday 31st October 2014, for departures commencing 1st November 2014. Privilege Club members will also earn 50% bonus Qmiles. Members need to register for the offer at least 24 hours before travel to be eligible. The companion offer is based on the year round fares and not our current promotional fares in Business class, however there should still be a significant saving to be made even when compared to current promotional Business Class fares. To register for the bonus Qmiles offer, members should log into their account online at qmiles.com, select “My Offers” on their dashboard menu and register at least 24 hours before travel. Qatar Airways has released two for one ‘companion’ fares for business class flights once again, with departures offered this time from London, Manchester & Edinburgh in the United Kingdom. Notable fares include Perth from £4680 for two – equivalent to £2340 per person return. Bookings must be made no later than 1st May 2014, for travel up to 31st August 2014. This offer is now extended for bookings made by 16th May 2014. These fares are non-changeable and non-cancellable, but they do earn points and miles in oneworld airline alliance partners’ frequent flyer programmes. Notable fares include Perth from £4655 for two – equivalent to £2327.50 per person return. Bookings must be made at least 6 days in advance of travel and no later than 15th February 2014, for travel up to 17th December 2014.